You met this cast of characters during Barack Obama's historic run to the White House. Now meet their holiday personas. Time Out Chicago called this "Best. Advent Calendar. Ever." A memento of a memorable election, it's also a great gift for political junkies. See John Edwards, the Red-faced Reindeer, behind one door; Jesse Jackson, the Nutcracker, and Bill Ayers, Frosty the Weatherman, behind two others. 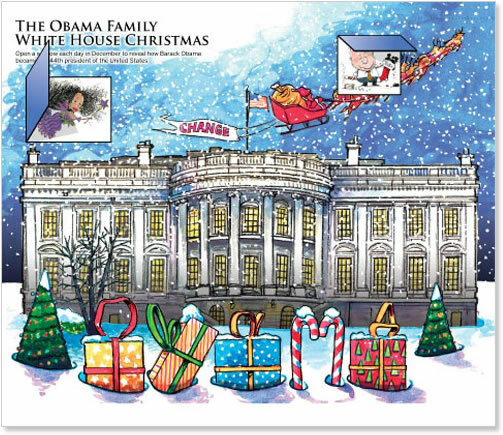 And of course, the season wouldn't be complete without Obama Claus and Mrs. Claus. A great keepsake and a perfect gift for Obama supporters, it's also a fun way to tweak Republican friends. Order yours before this limited edition runs out.